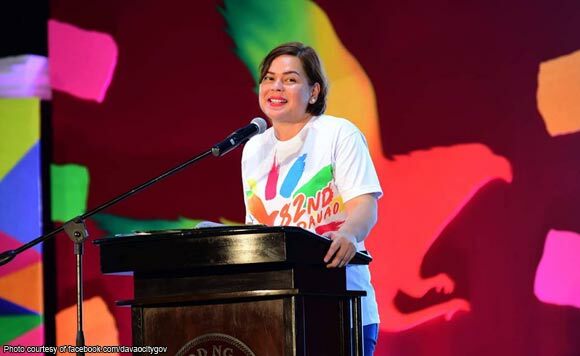 The 82nd Araw ng Dabaw celebration officially kicked off Friday night, with Mayor Sara Duterte-Carpio leading the event. The local chief executive thanked the traffic enforcers, garbage collectors, street sweepers, teachers, policemen, firemen, and soldiers for their contribution in maintaining order and security of the Dabawenyos. During the month-long celebration, the Dabawenyos will be entertained by several show business personalities. Actor-singer Sam Milby is the special guest during the Mutya ng Davao pageant at the Rizal Memorial Colleges (RMC) Petro Gazz arena. On Sunday, March 3, teen actress and singer Janella Salvador will inspire audience during the holding of the first ever Ginoong Davao male pageant at the Almendras Gym, which will feature 15 contestants. Actor Joseph Marco, on the other hand, will grace the first Reyna Dabawenya on March 8, also at the Almendras Gym. On March 16, singer and comedian Gladys Guevara will join the first Kanta Bidabawenyo, which will be held at the Rizal Park. City Tourism Office head Gene Rose Tecson said that all artists joining the city’s 82nd founding anniversary celebrations are paid for by San Miguel Corp., the city’s partner for the massive celebration this year. “These artists will join and celebrate with us to give more colors to the celebration of the Araw ng Davao. These events are created for the enjoyment of Dabawenyos and visiting tourists,” Tecson said.